Sometimes, a problem really can be solved by meeting halfway. For the past 4 years, planetary scientists have wrestled over where to send NASA's next Mars rover, a $2.5 billion machine to be launched in 2020 that will collect rock samples for eventual return to Earth. 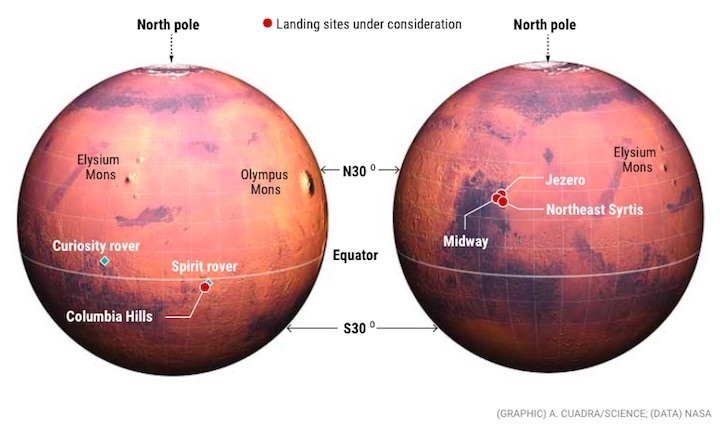 Next week, nearly 200 Mars scientists will gather for a final landing site workshop in Glendale, California, where they will debate the merits of the three candidate sites that rose to the top of previous discussions. Two, Jezero and Northeast Syrtis, hold evidence of a fossilized river delta and mineral springs, both promising environments for ancient life. Scientists yearn to visit both, but they are 37 kilometers apart—much farther than any rover has traveled. 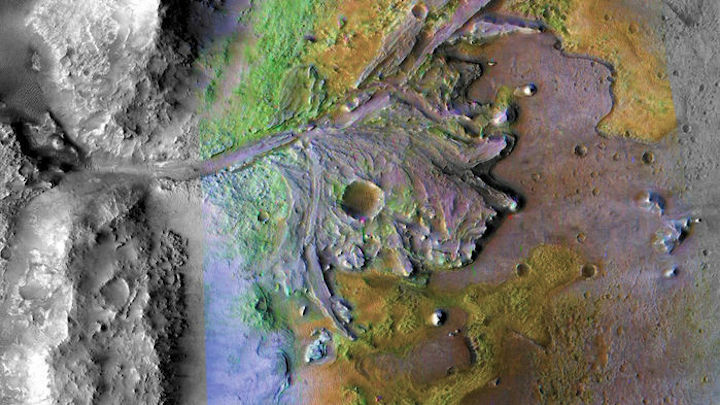 Midway and Northeast Syrtis both hail from a time, some 4 billion years ago, when Mars was warmer and wetter—an era never explored by a Mars rover. Surveys from orbit suggest the sites harbor rocks that formed underground in the presence of water and iron, a potential food for microbes. The rocks, exposed on the flanks of mesas, include a layer of carbonate deposits that many scientists believe were formed by underground mineral springs. Sheltered from a harsh surface environment, these springs would have been hospitable to life, Ehlmann says. "We should go where the action was."